Do you ever wonder what it's going to be like when you finally turn into a ghost? Well, we are pretty excited about it, and hope you are too! Not that we don't love life to the fullest, but we can’t help thinking about how cool it will be to suddenly appear in darkened chambers, able to shout BOO at our unsuspecting family members, on the search for a midnight snack. However, make sure you don’t drift through any bathroom walls, or you might stumble upon your uncle singing in the shower… eek! It sounds like our kind of fun, anyway... but until that fateful day, we're going to have to do our scaring in the living world, and we're going to have to use methods like this Fabric Ghost Mask. 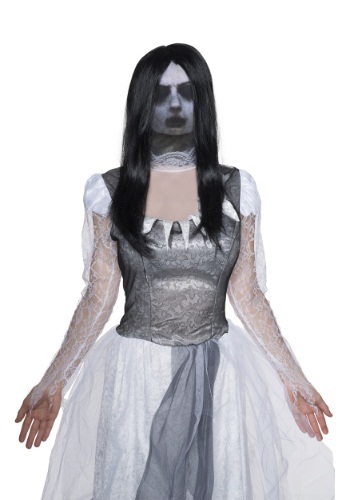 This mask, along with long brunette hair, comes complete with a ghost face printed on the hood, sure to scare the daylights out of any unsuspecting mortal!